If you’ve fallen off the healthy wagon after a good start in January, over indulged after a good dry January or eaten too many pancakes for Shrove Tuesday, then this Granola recipe may be just the thing to set you back on the right path. I’ve meant to make granola now for well over a year. I’ve researched recipes, collected ingredients (used them for other things), planned, planned some more but not quite got round to doing it. But really, granola …. buy it at the supermarket, save the time, eat it once or twice and throw out what’s left. Isn’t that how it works? Okay maybe you are more disciplined than me. But its rare for me to find shop bought granola I actually really want to eat more than once or twice. Making it, for some reason also seemed a tedious chore, I guess if I thought it’d be the same as what was already in the cupboard, so what was the point? The stuff that was in the cupboard is now in a separate tub for Ted, our cocker spaniel, who thinks it’s an awesome treat – so there’s an extra win! However ….. I finally got motivated and made some and WOW! I just love it, and there’s going to be more and more, and once the summer comes and it feels like granola weather there’ll be no stopping me. Obviously being me I scoured the internet over a period of months (okay years, you know me too well already!) looking for ideas and then because none of them matched what I had in my head, I looked at quantities and then just did what I thought. So there is no scientific reasoning to what follows, it was purely a case of looking at other recipes and the amounts of ingredients and then coming up with my own initial list of ingredients. I say initial because I’ve already got ideas for the next batch! I’m hooked and … its SO EASY!! But you know it came out right, at least we think so and I’m happy enough to share, so that says something I hope. All the recipes I found dealt in cups, which don’t come easy to me, but luckily I’ve a set of cup measures in the cupboard so out they came. At some point I will endeavour to convert the cups to a metric/imperial measure – but please don’t hold your breath. I’m not renowned for hasty stuff on that score. 1/2 cup of nuts – use whatever you have or whatever you like most – I used a mix of almonds, walnuts and macadamia nuts because that was what was in the larder. Pecans would be lovely and were intended but someone must have eaten them! Weigh out the dry ingredients and add to a large bowl. Give them a big mix up. If you are using a conventional oven you’ll need to preheat it to 300F/150C/GasMark 2. If you are using an AGA like me, it goes in the baking oven. Add the remaining ingredients and mix well. I used my hands but I’m sure a big wooden spoon would do the job just as well and be a lot less sticky. The coconut oil may be solid – mine certainly was as it came directly from the fridge. But it will melt if not in the mixing then certainly in the oven. Once mixed you can simply turn it out onto a baking tray. 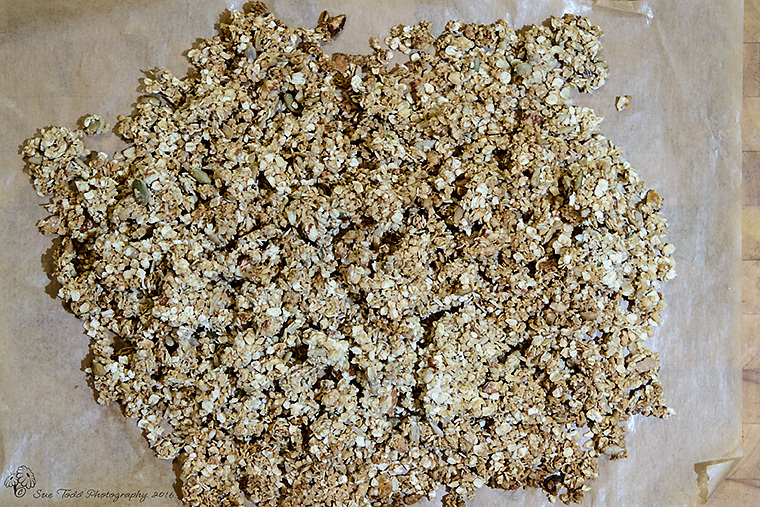 I lined my baking tray with baking parchment, simply because it’s easier then to lift off and turn into a jar using the baking parchment to guide the granola than it is to try and tip a tray of the stuff into a jar later! Stick it in the oven for 10 minutes to cook. It needs to be very lightly toasted. Once cooled, put in an airtight container until ready to serve. Put in a bowl, food flask or glass, add yoghurt and fresh or dried fruit and munch. It’s totally portable in a container if you need to take it to work – though I’d keep the yoghurt separate during transit so the granola doesn’t get soggy. The maple syrup and vanilla flavours are lovely. You could add cinnamon for more flavour but I’m allergic to it, so it won’t feature here much. You could also use dried fruit as part of the mix. Lots of people add it before toasting but I really didn’t fancy my dried fruit even drier or toasted and on this occasion I just missed it out. However I’m also thinking that soaking dried fruit in orange juice overnight and then adding it to your bowl might be rather yummy. Fruit compotes would also work really well with this. 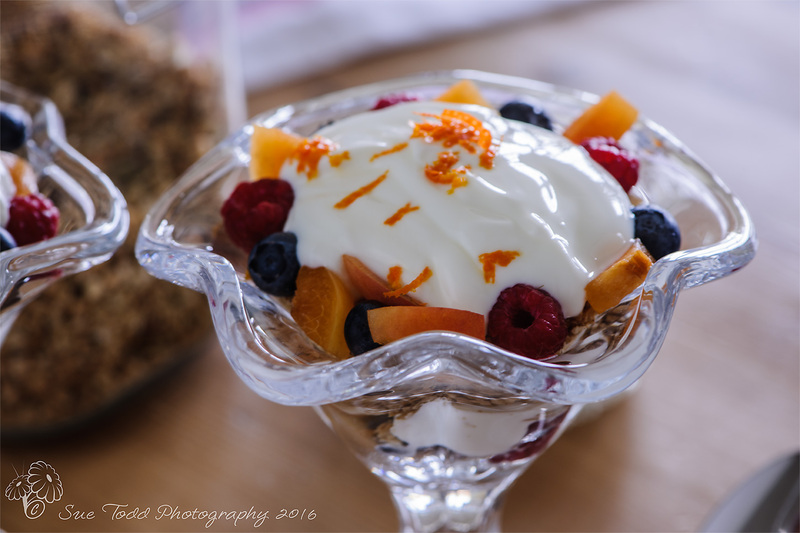 If you are looking for food photography please visit Sue Todd Photography also you might want to follow English Country Cooking on Facebook, if so you can find us here. 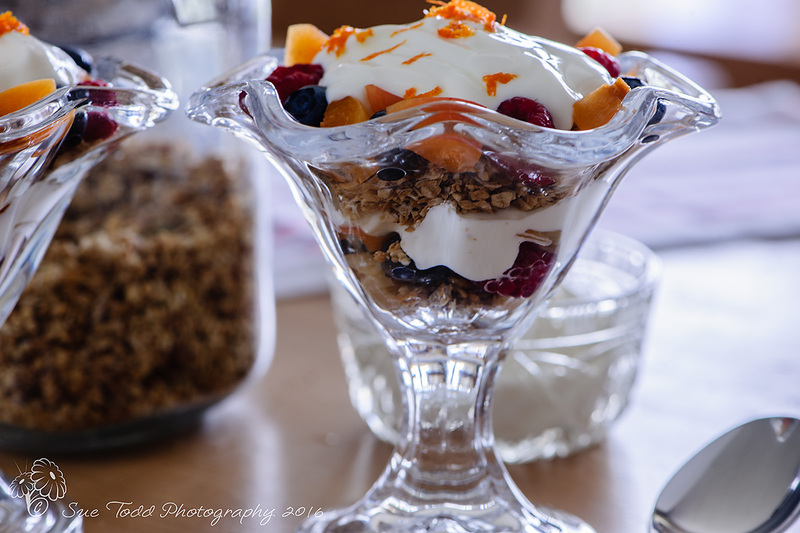 This entry was posted in Breakfast, Food, Recipes and tagged Breakfast, Granola on February 10, 2016 by Sue Todd.